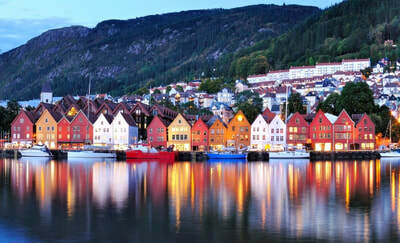 ​of northern Europe’s scenic areas. Thu., Jun 06–Hamburg/Lübeck/Copenhagen: Stop and explore the the Historische Altstadt of Lübeck on foot. You'll see Lübeck's historic Marienkirche (the world's tallest brick church). Other noteworthy points on the walk include the Dom (cathedral), the Burgtor (a medieval gate), the Schiffergesellschaft, the Hospital of the Holy Ghost, and the Museum Harbor with its vintage sailing ships. End your walk at the pedestrian passages which make Lubeck’s Old Town so unique. 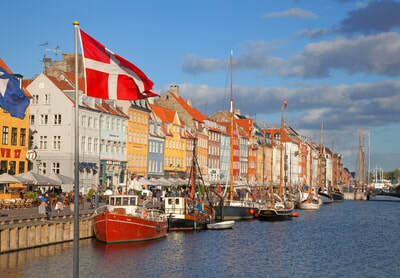 After the tour continue your way to Denmark by a 45-minute ferry crossing. On arrival in Rodby lunch is included as a tour service before we continue on to Copenhagen. Free evening. Copenhagen Island Hotel accommodations, including daily breakfasts. Fri., Jun 07– Copenhagen: Morning city sightseeing of Copenhagen includes Christiansborg, the seat of the Danish Parliament and a visit to the Rosenborg Palace. Afternoon is free for individual pursuits. This evening, entrance and dinner in Tivoli Gardens is included as a tour service. Sat., Jun 08– Copenhagen/Oslo: Day is free to further explore Copenhagen on your own. This afternoon we arrive at the pier to board our overnight ferry to Oslo, Norway. Accommodations, buffet dinner and breakfast included on-board the DFDS ferry. Sun., Jun 09 - Oslo: Morning arrival in Oslo. Upon arrival, we explore Oslo to learn about the city’s history and culture including a visit to Vigelund Sculpture Park. Hotel The Clarion Hub accommodations, including daily breakfasts. Balance of the day is free. Tue., Jun 11– Oslo/Lillehammer: Our tour takes you to the Ski Jump arena from the Lillehammer Olympics and Maihaugen, Norway’s largest open-air museum. Lunch is included as a tour service. Hotel Scandic Lillehammer accommodations, including daily breakfasts. Wed., Jun 12– Lillehammer/Bergen: Travel from Lillehammer to Bergen via a scenic ferry ride from Flam to Gudvangen. Beautiful, wild and dramatic are the words most often used to describe the three hour trip along the Nærøyfjord and Sognefjord. 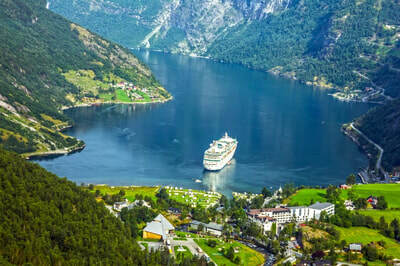 This ferry trip is a unique opportunity to experience several of the most beautiful fjords in Norway. Upon arrival, drive to Bergen. Hotel Radisson Blu Royal accommodations, including breakfast. Thu., Jun 13- Bergen: Morning enjoy a walking tour of Bergen. Visit the downtown area includeing the Fish Market, town square, city park and the Bergenjus Fortress. Continue by driving out of the city center to Troldhaugen passing by the Royal Residence, where the king stays when he visits Bergen. Visit the composer Edvard Grieg’s beautiful villa, including a brief concert in one of Norway’s most beautiful chamber music hall in the midst of the Grieg Museum grounds. Afternoon Free to enjoy the city on your own. Dinner is included as a tour service.